This post has been in the works for weeks now and I've contemplated not even posting it because the chances of me ever getting through a reading list now that I have a baby is pretty poor. But I love lists, especially reading ones. I was always so jealous of the kids in TV shows and books that got sent home with reading lists for the summer. I wanted one too! (Is this an American thing or did I just go to the wrong school?). I'm hoping that if I have a bit of a plan on what I want to read over the next few months, I might be a bit more successful than if I didn't have a list at all. I find that a lot of time can pass in between books I read because I'm never sure what to read next and easily get overwhelmed by the pile shelves of unread books I own. For the sake of trying to spend less money and not further overload my bookshelves with even more unread books, my reading list for this summer isn't going to feature any new releases or block busters. But I'm totally ok with that because I know there are a lot of great books out there that I've missed. Also, it goes without saying that a few of the books will be mommy/parenting related. There's just no getting away from it now that baby is here! An Abundance of Katherines: This month's book club pick was A Fault in Our Stars (which I read a few years ago) and after our discussion that night, it got me wondering why I haven't read anything else by John Green. I already own An Abundance of Katherines, a novel about a boy named Colin who only dates girls named Katherine, despite always being dumped by them (19 times to be exact), and I'm thinking it's the perfect easy read for summer. Falling Together: I've loved all of Marisa de los Santos previous books, yet this one has been sitting unread on my shelf for a few years now. Falling together is a story of past meets present, where three friends from college reunite after 6 years apart and uncover truths about each other that they're not sure they wanted to know. Outlander: I read this book exactly 15 years ago when I spent the summer on my grandparent's farm in Croatia. I was 16 years old and fell in love with the story of Claire and Jamie. I never made it past the second book in the series, but now that the TV series is set to air this August, I feel it's finally time to reread this saga. Baby-led Weaning: It's hard to believe that Sully will be ready to start eating solids in less than 2 months, but the theory behind baby-led weaning has me really excited for this milestone. I've done some of my own research via the internet and friends, but am really looking forward to reading all about it in this book. Bringing Up Bebe: This book has been on my radar long before I even got pregnant. "One American Mother Discovers the Wisdom of French Parenting". I've always been fascinated by parenting in other cultures so I can't wait to dive into this one. 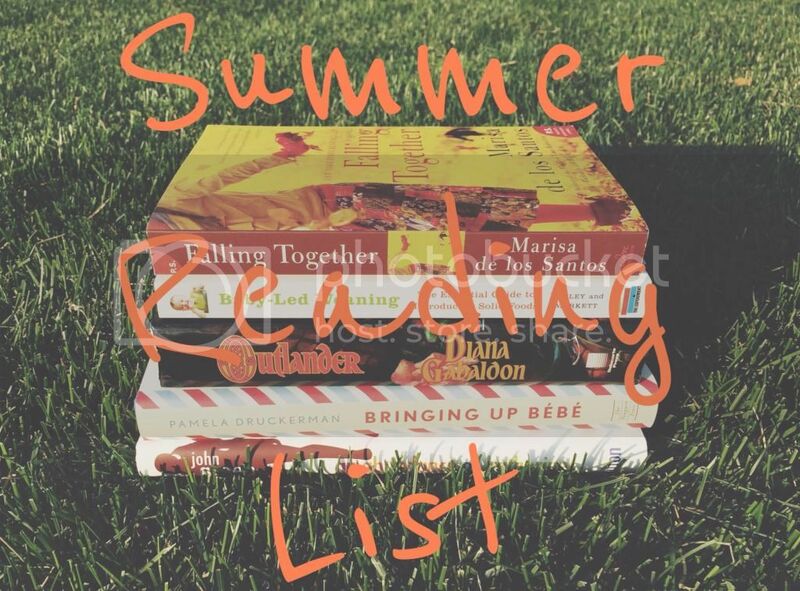 Do you make summer reading lists? What books are you hoping to read this summer? We're doing baby led weaning and it's great! There are days, though, where he just wants to play with his food and not eat anything, but baby steps. Other days he'll demolish most of what we give him. He was never a fan of me feeding him and now if I try he just wants the spoon. Have fun reading up on it! Yay for Outlander! I can't wait for the TV show ... I'm considering my fourth (or fifth?) reread soon! It's just sooo good! I can't believe you've read Outlander that many times!! An Abundance of Katherines sounds like an odd one, but I'm willing to give John Green another go. I'm just hoping that the dialogue's a bit more (waaaaay more) realistic compared to TFIOS! Ha! Somehow I doubt it… ;) But we shall see! I just bought An Abundance of Katherines, so I want to read it soon. Bringing up Bebe sounds really interesting too!